Eric Ollis, President of Lexul, and his team have graduated from our Incubator space at the Jutila Center. They didn’t move far, though. The Lexul team now occupies a bigger, brighter space on the 6th floor of the building which was made available to them by Finlandia University. The company grew fast over the past several years and was in need of a larger space. This expansion worked out well for them as they have the ability to build the office out to fit their needs. 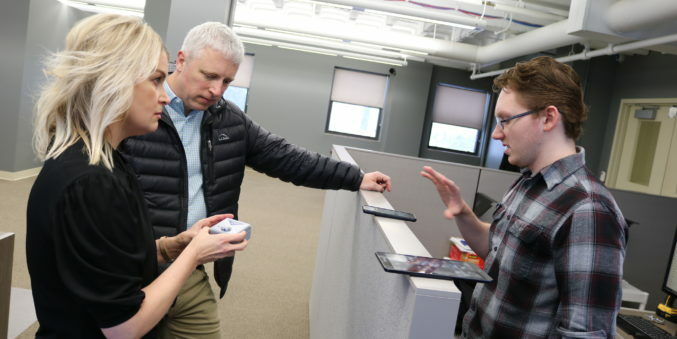 Pictured above is Keith Atkinson, Lead Developer at Lexul, showing off a recent project to Jody Johnson and Spencer Stang of Stang Decision Systems.